Since its foundation in 1958, the European Union (EU), then European Economic Community (EEC), aims to reduce welfare differences between its member states by promoting economic growth in its economically underdeveloped regions. The long-term objective is to foster the convergence of income and GDP per capita levels within the Union. This policy is known as European cohesion policy which nowadays accounts for more than one third of the EU’s total budget and is separated into different structural and cohesion funds with the European Regional Development Fund (ERDF) being by far the most voluminous and important one. The vast financial importance of the cohesion policy motivated academic research to address the question of effectiveness of the cohesion policy in promoting growth and convergence within the EU. However, most studies yield fragmented results as they only focus on single EU member states or consist of data for short time periods. Furthermore, there is little literature that consists of data for Eastern European member states that joined the Union with the enlargements of 2004 and 2007. My empirical work is close to the methodological approach of Ederveen et al. (2006) (henceforth EGN) who address the question of effectiveness of structural funds and whose paper is one of a few using large-scale panel data for all European countries comprising the years 1961-1995. I address the weaknesses of this and other previous studies using data for the time span 1961-2015, hence, including data for the period of large expansions of the cohesion budget in the late 1990’s and with recent and extensive data for new EU member states. This allows me to capture long-term effects of structural funds in the recent past and to deliver more accurate and meaningful empirical results compared to EGN. I focus on data for the ERDF since it is the most important item of cohesion policy and especially finances projects that aim to foster convergence directly. The structure of this paper is based on the following questions: Are structural funds effective in promoting economic growth, and if so, do they promote income and welfare convergence within the EU? Chapter 2 provides information on the structure of European cohesion policy throughout its history as well as its practical implementation. This is essential to understand how cohesion policy might affect economic growth and welfare as it provides useful insights about what focus the EU sets by allocating structural funds. Furthermore, it allows to draw a link between the practical implementation of cohesion policy and predictions that are given by economic growth theories. 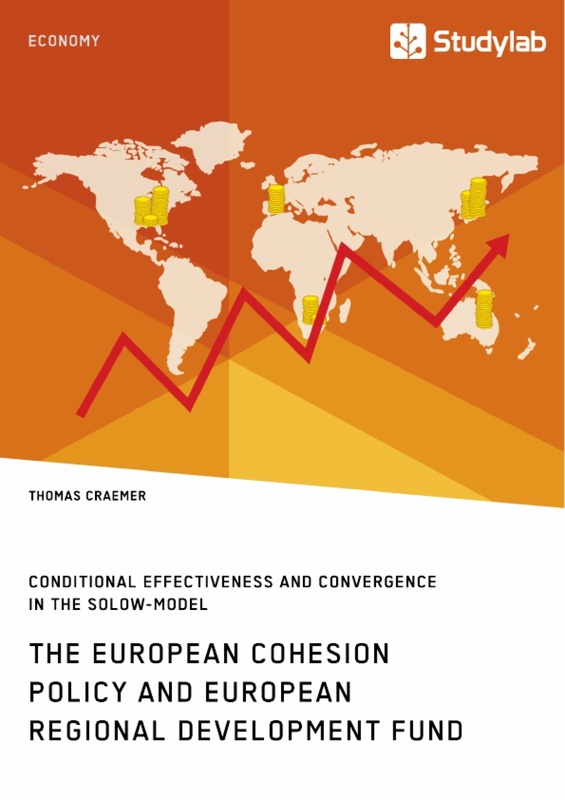 Therefore, Chapter 3 presents the basic conclusions from different strands of economic growth models and illustrates through which channels theory allows cohesion policy to impact growth in GDP per capita and income levels within the EU. Since my empirical work is built upon an extended neoclassical Solow-model, I derive the algebraic structure of this model in this Chapter, too. Besides that, a brief literature overview highlights the findings of previous studies on structural funds and their different findings on the effectiveness of cohesion policy to foster growth and convergence. Chapter 4 then comprises the empirical body of this thesis. To answer the questions of effectiveness and convergence the Chapter is divided into two main parts. First, I analyze the impact of ERDF support on growth of GDP per capita in different specifications that control for measures of institutional environment. ERDF support seems to be at best conditionally effective in promoting growth depending on the institutional framework of the receiving country. The second part illustrates that those countries whose growth rates are positively affected by structural funds are among the richest EU member state. One can see that structural funds do not promote absolute convergence within the EU. This trend becomes even stronger when taking new Eastern member states into account. However, there is scope for an increase in the rate of conditional convergence towards country- and region-specific steady states. This paper yields some important insights for policy makers and academic research since it confirms previous findings on the conditional effectiveness of structural funds covering the largest time span with most recent data so far and exploiting the fact that more than one decade after the eastern EU-enlargement, the economic response of new member states to structural funds can be identified more precisely than in the years shortly before or after accessing the Union. Nowadays, a major field of activity for the EU is to financially support the regional development in its member states, especially in those regions that lag behind the EU-average in productivity, income, economic growth or employment. This policy of promoting economic development in the poorest regions and reducing welfare differences within the Union is known as European cohesion policy. The by far most important program of European cohesion policy is the ERDF. With about 196 billion Euro in the period 2014-2020 the ERDF accounts for more than 30% of the total EU budget (EC, 2017a). The purpose of the ERDF has been to promote economic growth to reduce incongruities in the level of development between regions and by offering support “to redress the main regional imbalances in the Union through participation in the development and structural adjustment of regions whose development is lagging behind” (EU, 2012, p.127). From an economic perspective, this includes to foster the rate of convergence in terms of GDP per capita and to abolish large gaps between incomes by increasing the rate of public investment. Compared to other structural and cohesion funds, the ERDF stands out due to its focus on investments in infrastructure, research and support for regional enterprises as channels through which economic convergence can be implemented. The idea of a common European cohesion policy arose with the foundation of the EEC in 1958 and the treaty of Rome. But a first policy implementation started only in 1968 with the creation of the Directorate-General for Regional and Urban Policy, a directorate of the European Commission (EC). Its area of responsibility includes the coordination and implementation of structural funding which took its course with the introduction of the ERDF. The fund was established in 1975 under the pressure of the United Kingdom and Italy to compensate for their large contributions to the budget of the EEC and the Common Agricultural Policy in which they did not qualify for nameable grants (Stephen, 1990). In the following the ERDF enabled financial support for less developed regions in the EEC like Northern Scotland or Sicily. While launching with a budget of 1.4 billion Euro in 1975 the volume of the fund increased steadily over the course of time (EC, 2017b). The accession of Greece (1981), Spain and Portugal (1986) to the European Single Market (ESM) demanded for a wider range of actions the ERDF could engage in, so that the volume reached 3 billion Euro only for the year 1986. While during the years 1975 and 1980 every member state was assigned to a fixed share of the budget depending on its needs, the Iberian enlargement in 1986 sought for a more flexible system with lower and upper bounds which evolved from region-specific projects, for instance investment in infrastructure. Furthermore, a Mediterranean Program complemented the ERDF to speed up economic convergence of Spain and Portugal to pan-EEC standards (EGN, pp.34-35). In 1988, European cohesion policy was fundamentally reformed based on the Single European Act (1984). Structural funds were allocated in operational periods (EGN, p.35) with the first one comprising the years 1989-1993. The ERDF was modified to concentrate on a limited number of projects, multi-annual programming based on strategic planning and to introduce a five-objective system that categorized regions into different funding groups. Depending on its objective-group, regions qualified for different types of funding. Objective 1 regions were underdeveloped in general and demanded for convergence in per capita income, while Objective 2 regions relied heavily on industries in decline. The other three groups qualified for funds to fight unemployment, to integrate young people into the labor market and to promote the development of rural areas. The volume of total funds increased to 71 billion Euro (0.3% of total GDP of the EEC) with the main beneficiaries being Spain, Italy, Portugal and Greece (EC, 2017b). With a volume of 34 billion Euro the ERDF made about 49% of the total cohesion budget (Benedetto et al., 2012). The major part of funds was allocated to Objective 1 regions and invested in infrastructure, in direct and indirect aid to small and medium-sized enterprises (SME) and in education to promote a catching-up of the less developed regions. Moreover, several smaller funding programs like the European Social Fund (ESF) and the Cohesion Fund (1993) were introduced or enlarged to support the ERDF. A system of national co-funding was set up to counteract a crowding-out of national aid and investments were taken in cross-border cooperation to foster external effects between neighboring regions (EC, 2008, pp.10-14). The second operational period from 1994-1999 was structured against the background of the Maastricht Treaty (1993) which marked the transition from the European Economic Community to the European Union. Its aim to move towards an economic and monetary union shaped the structure of European cohesion policy and the ERDF. A major novelty was the creation of the Committee of the Regions, an assembly at the EU-institutions to coordinate cohesion policy from a regional and local perspective. While leaving the main objectives unchanged, structural funds were endowed with the competence to focus on the promotion of equal work for men and women, the development of regions with low population density (Objective 6 - especially for regions in Scandinavian countries that joined the EU in 1995) and to fund up to 85% of infrastructural projects. Especially the latter was of great importance again as the EC estimates that the building or upgrading of about 36 000 km of roads were financed by structural funds in that period (EC, 2008, p.17). Furthermore, the involvement of the EU institutions, especially the European Parliament and the inclusion of national employment policies were strengthened. The total budget of structural funds increased to 168 billion accounting for about a third of the total EU budget and 0.4% of the Union’s GDP with the ERDF representing 44% of it. This expansion of the cohesion budget had been the largest until then and marked the beginning of a change in cohesion policy with budgets increasing by large amounts from period to period in the following years. Main beneficiaries in this period were again the Mediterranean countries but also re-united Germany with its poorer eastern federal states (EC, 2008, pp.15-17). The two major topics of the period 2000-2006 were the simplification of the legislative and operational procedure of European cohesion policy as well as the preparation for the EU-enlargement in 2004 with the ten new member states of which seven were former communist states of the Eastern Bloc. The new member states accounted for a much lower economic development as the primary fifteen EU-members and brought large disparities in income and employment. While Poland had a GDP per capita (PPP) that was only 46.2% of the EU-15 average in 2005, Slovenia had already been close with 82.8%. Whereas the enlargement increased population by 20%, total GDP grew only by about 5% (Goecke, 2013, pp.11-15/Eurostat, 2005). Hence, economic convergence became an even more important subject for the EU. Before joining the EU, the ten new member states received financial support in three programs of “pre-accession and transition instruments”. The largest was the program “Poland and Hungary: Assistance for Restructuring their Economies” (PHARE) with a budget of annually 1.56 billion Euro in the period 2000-2004 (European Council, 2005, p.27). After joining the Union, new member states dropped out of these programs to get access to cohesion policy and structural funds. As the territory of the new member states almost completely qualified for Objective 1 ERDF support (general underdevelopment) the budget of cohesion support was raised again to a total of 213 billion Euro in this period whereas 21.7 billion Euro were provided to new member states for the years 2004-2006. With 129.6 billion Euro, the ERDF made about 55% of the whole cohesion policy budget (EC, 2013). Furthermore, the enlargement not only demanded for another budget boost, but also for a reform of the policy itself. High unemployment and post-communist structures in the new member states claimed a paradigm shift towards more innovation based growth, modernization and the fight against structural unemployment by investing in modern education- and health-systems, promoting structural change and enhancing digital innovation. These reforms included also a large-scale facilitation of cohesion policy. From the former five and later six ERDF Objectives only three remained in 2007 as some of them were merged. (EC, 2008, pp.18-21). The period 2007-2013 was characterized by re-defining the three remaining ERDF Objectives as they were categorized into different priority funding-groups. The first one Convergence aimed at accelerating the process of economic convergence of the least developed regions. Regions with a GDP per capita lower than 75% of EU-average fell into this group. All other regions were covered by the second funding-group called Regional Competitiveness and Employment. A third category European Territorial Cooperation focused on interregional support and was determined for specific extra-projects in cross-border regions that were already covered by one of the other funding-groups. For regions that dropped out of funding due to economic progress, structural funds were endowed with the possibility to finance phasing- in and phasing-out periods in which regions gradually received less financial support (EC, 2008, pp.22-23). Besides that, the number of financial instruments was reduced leaving the ERDF, ESF and the Cohesion Fund. Smaller funds that had been established in the years before were integrated into existing agricultural funds. Once again, reforms were accompanied by an expansion of the budget. The volume of funds increased to 347 billion Euro representing 35.7% of total EU-budget and accounting for 0.4% of total EU-GDP. The ERDF had a volume of 200 billion Euro. The focus on supporting the convergence of regions becomes apparent by the fact that about 80% of the budget were spend on regions that qualified for the funding-group “Convergence” (EC, 2016, p.10). This strong setting on convergence resulted in large expenditures on infrastructure. Solely in the field of transport, 25 000 km of roads and 7 700 km of railroads were built or reconstructed in that period. Public investments in education are expected to have created about 40 000 jobs in research (EC, 2008, p.25). The current period from 2014-2020 only consists of a few changes compared to 2013. Cohesion policy and structural funds aim to use the existing instruments and definitions of objectives to additionally fund more projects that focus on urban convergence and development. This includes projects that support social inclusion. The budget for cohesion policy just increased slightly up to 351.8 billion Euro while 196.3 billion Euro (55.8%) fall upon the ERDF. Less developed regions are still by far the main recipients of funds with 178 billion Euros of received financial support (EC, 2017c). The main priorities of the ERDF are to strengthen technological development and innovation, to enhance the access to information technology, to enhance the competitiveness of SMEs and to implement environmental targets (EC, 2017d). This is in line with the focus of the ERDF in previous funding periods on public investments in infrastructure, financial support to enterprises and education as a channel to foster convergence. The practical implementation of the European cohesion policy follows a top-down mechanism to structure the interaction between the regional, national and European level. Every funding period starts with a budget proposal by the EC and a system of rules that is approved by the European Parliament and the Council of the European Union. In a next step, the EC determines in coordination with the member states how the budget should be distributed over regions and which funds should be used for different targets. Next, the member states offer a range of certain projects that they want to be funded and apply with them. The EC then decides if the projects qualify for funds and if so, to what extend (Ederveen et al., 2002, p.6). Once financed with structural funds, the evaluation of projects falls under the responsibility of regional authorities. This may become problematic since poorer member states and poorer regions tend to have less developed bureaucratic structures that makes the implementation of regional projects costlier and less efficient (Ederveen et al, 2002, p.7). Since, the ERDF focuses in the recent funding period with about 80% on these regions in the Convergence-Objective, the supportive effect of the fund may be diluted to a certain extend. Moreover, Ederveen et al. 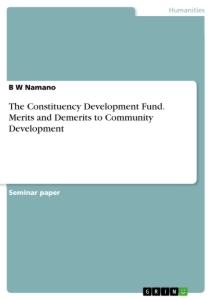 (2002, p.7) show that structural funds are mainly allocated to poorer countries as the poorest regions which qualify completely for ERDF (less than 75% of the EU average in GDP per capita) support tend to lie within poor member states. Hence, cohesion policy is redistributive on a national and regional level. However, rich member states also qualify for financial support on convergence with their poorer regions (see Table B1 in Appendix). This may counteract the redistributional character of the ERDF and the aim to reduce welfare differences from a national perspective, although it supports catching up on a regional level within member states. This problem may be enhanced since relatively rich regions may receive funds when support is “thematic” instead of “territorial” (Ederveen et al., 2002, p.11) with richer regions also getting access to funded infrastructure projects. Of further importance is the problem of crowding-out. Regional and national governments may retrieve their own financial support for underdeveloped regions when qualifying for European support. The EC recognized this problem as a major-difficulty in cohesion policy and installed the system of co-funding with the great reforms in 1988 (see previous section). Nonetheless, Bachtler and Taylor (1996) find that a system of co-funding may not solve the whole problem of crowding-out since many projects would have been undertaken even without European funds. Another problem arises as European cohesion policy may set incentives for member states and regions to engage in moral hazard and rent-seeking. Regional authorities and member states have the incentive to solely apply with those projects at the EC that are most likely to attract funds. Other projects that have a higher social benefit in a region and are much more appropriate to foster convergence might not be considered in favor of more promising projects in terms of cost-benefit analysis (Ederveen et al. 2002, p.24). Murphy et al. (1991) illustrate that increasing opportunities for rent-seeking might have a negative impact on economic growth as it afflicts innovative activities due to a misallocation of talent. 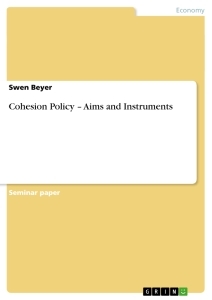 Cohesion Policy might also weaken processes that bring about convergence as well. The free movement of goods, capital, services and especially labor within the EU brings about convergence in terms of per capita income. While labor mobility induces people to migrate to richer regions lowering per capita income there and pushing it in their poorer home region, cohesion policy may lead to distortions. In that sense, regional financial support by structural funds leads people to stay in unproductive and underdeveloped regions (Boldrin and Canova, 2001) offsetting the natural labor mobility of the market. Finally, in practice, the introduction of phasing-out and phasing-in support in 2007 generates an inertia that needs to be considered when interpreting the empirical results in Chapter 4. This inertia is an inherent part of cohesion policy and slows down the speed at which economic convergence occurs. European cohesion policy aims to reduce welfare differences within the EU by promoting growth and welfare in underdeveloped regions. The approach of European cohesion policy (especially the ERDF) to foster regional economic convergence by enhancing growth in GDP per capita and cutting unemployment rates in underdeveloped regions originates from different strands of economic growth theory. This chapter summarizes the dynamics of different growth theoretical approaches and gives some insights on how theory matches with the main instruments of structural funds that are basically an increasing rate of investment in infrastructure, technological innovation, research, education and in the support for SMEs. Section 3.4. presents the results of empirical evaluation literature. [Abbildung in dieser Leseprobe nicht enthalten], for all dates . which tells how the capital stock changes over time. Capital in period equals the stock of capital from the previous period minus the fraction of capital that depreciated plus the investments undertaken in period t.
An economy is in a steady state when the per capita capital stock is such that the capital-output ration remains constant. The exogenous variables of the model – the savings rate, population growth rate or the depreciation rate- do not determine the long-run growth rate of per capita income, but the level of the steady state (Ray et al., 1998, p.69). Figure 1 illustrates this pattern. The intersection of and defines the steady state levels of output and capital per worker . The model makes an essential statement when returning to the topic of structural funds. An increase in public investment can be seen as an increase in the model’s savings rate to a higher level shifting the steady state levels of output and capital stock upwards. When extending the basic Solow-model to technical progress and population the same mechanisms hold and the model draws some important conclusions. A higher savings rate (that is, a higher investment rate in capital) increases the steady state level of per capita output or income while higher population growth or depreciation has the opposite effect. In the steady state, the economy’s growth rate only depends on the rate of technological progress. A further key implication of the Solow-model is that an economy always converges to the steady state regardless of the initial capital stock due to diminishing returns to scale. In fact, this means that economies which start below the steady state level of per capita income grow faster to converge towards the steady state. In contrast, countries that start at a higher level face lower growth rates when converging to the steady state. Consequently, the Solow-model predicts unconditional convergence with similar economies reaching the same steady state. In the light of European cohesion policy, the model would predict the convergence of welfare among regions that are similar in terms of population growth, technology and investment rate which seems to be quite an unrealistic assumption. Anyway, the Solow-model also allows for the notion of conditional convergence meaning that economies with different parameters converge to different equilibria, but each reaching its respective steady state. In Chapter 4 I will determine as the rate of convergence that is the speed at which the economy converges to its steady state. When structural funds are allocated to projects that influence exogenous variables like savings and population growth, the Solow model allows cohesion policy even to reduce gaps in the steady state levels between regions and not only to speed up the rate of convergence to the individual steady state by increasing capital stocks. Mankiw, Romer and Weil (henceforth MRW, 1992) augment the Solow-model by including the accumulation of human and physical capital with a one-third Cobb-Douglas production function. They argue that since human capital may be correlated with population growth and savings rate, the standard Solow-model could be biased when excluding human capital. Moreover, they expect physical capital and population growth to have a greater impact on income when human capital accumulation is considered. MRW see their theoretical predictions confirmed by their empirical analysis. They use annual data from 1960-1985 in 95 countries to show that when holding capital accumulation and population growth constant, the augmented Solow-model explains a major part of observed per capita income disparities between countries. In other words, the large welfare differences across countries in the world today can be explained in large parts by the augmented Solow-model when conditioning on population growth and capital accumulation. In contrast, MRW do not find evidence for unconditional convergence in the data neither with the standard Solow-model nor with the augmented version. Considering the standard as well as the human capital augmented Solow-model, European cohesion policy may speed up the rate of convergence between two similar local economies (unconditional convergence) and the rate of conditional convergence to an economy’s respective steady state when regions differ in their fundamental variables. Furthermore, if structural funds with investments in education, research, productivity and SME’s not only affect capital accumulation but also individual economic characteristics like technological progress, savings rate, inflation and population growth, neoclassical growth theory leaves scope for convergence between regions that formerly differed largely in their economic characteristics. A further model close to the standard-Solow model but that must be classified as Keynesian is the Harrod-Domar model (Ray et al., 1998, p. 73). The main modification of this model compared to the neoclassical approach is the additional assumption of a constant marginal product of capital resulting in a linear production function. Since more and more input leads to a one-to-one increase in output, the economy does not reach a steady state. The economy “can grow or decline at exactly the same rate, regardless of scale” (Ray et al., 1998, p.74). The economy then grows at the same rate as the per capita capital stock. In contrast to the standard Solow-model the exogenous variables (savings, population growth and depreciation) have growth and not only level effects. Consequently, European cohesion policy may have growth effects when it ensures a continuous increase in the capital stock and when affecting exogenous variables. For instance, public investment in infrastructure, research and education does affect savings and may affect population growth (Malthus, 1992/Lee, 1997, p.1097). If, instead, public investment under the neoclassical framework is used for temporary public consumption, it only brings a temporary demand effect on the economy not affecting economic parameters in the long-run. While neoclassical growth theories take model variables like population growth, technological progress and saving rates as exogenous, endogenous growth theories see these variables and thus long-rung growth rates as dependent on economic factors within the model. A first attempt to formulate endogeneity in growth models can be found in the AK-model formulated by Frankel (1962) which does not distinguish between capital accumulation and technological progress. It defines output as a linear function of capital which represents a main difference to the neoclassical view with its diminishing marginal product of capital. A central argument of the model is that technological progress is associated with the creation of intellectual capital which arises when firms accumulate capital. This technological progress, in turn, countervails the tendency of the marginal product of capital to diminish such that when it is exactly constant, the output is proportional to the capital stock (Howitt, 2008). Economic long-run growth then depends on a savings rate which can be fixed as proposed by Frankel (1962) or determined by intertemporal utility maximization as it is introduced by Romer (1986) in a modified version of the model. A further step away from the neoclassical theory of diminishing marginal products of capital has been taken with the introduction of a human capital model with increasing returns to scale. Lucas (1988) builds this growth model in parts upon the modified AK-model by Romer (1986). The model allows individuals to make decisions on how they invest their initial human capital. It can be used to either produce output or to accumulate more human capital while the technological level of the economy remains constant. Since human capital enters the production function with a term allowing for knowledge-externalities and increasing returns to scale, long-term growth is determined by the accumulation of human capital which raises the marginal product of capital and the output per capita. Another model of endogenous growth proposes an innovation-based perspective on intellectual capital and long-run growth (Romer, 1990). The model assumes that productivity increases with the economy’s variety of products. While human and physical capital are accumulated by education and savings, respectively, intellectual capital originates with innovation. Innovation increases the stock of intellectual capital which in turn raises the economy’s productivity and long-run growth rate by creating a wider range of products that need not to be quality-improving. Hence, investments in research and development (R&D) stimulate long-run growth. This theory is closely related to the concept of “creative destruction” (Schumpeter, 1942) where innovation produces quality-improved products and thus pushes productivity and economic development. This selection of models illustrates that endogenous growth theory combines different drivers for technological progress and economic growth. Human capital, innovation, knowledge externalities and constant or increasing returns to scale may be key to stimulate a country’s or a region’s economic development. Endogenous growth theory explains differences in economic development by different efforts to generate knowledge on new technologies. When the returns on human or intellectual capital are not diminishing or if the costs of innovation fall with scientific experiences, advanced economies have an advantage in generating technological progress and economic growth (Ederveen et al., 2003, p.13). Therefore, endogenous growth theory does not predict convergence but even allows for divergence. Anyway, European cohesion policy with its redistributive investments in R&D, education and digital innovation may be a successful tool to promote economic development in poorer regions as it can give an initial push in the accumulation of human capital and innovation. Then, it may close the gap between poor and rich regions or at least reduce forces of divergence. Hence, endogenous growth theory allows structural funds to have a positive effect on regional convergence within the EU when policy interventions reduce differences in human capital stock and the creation of innovation.